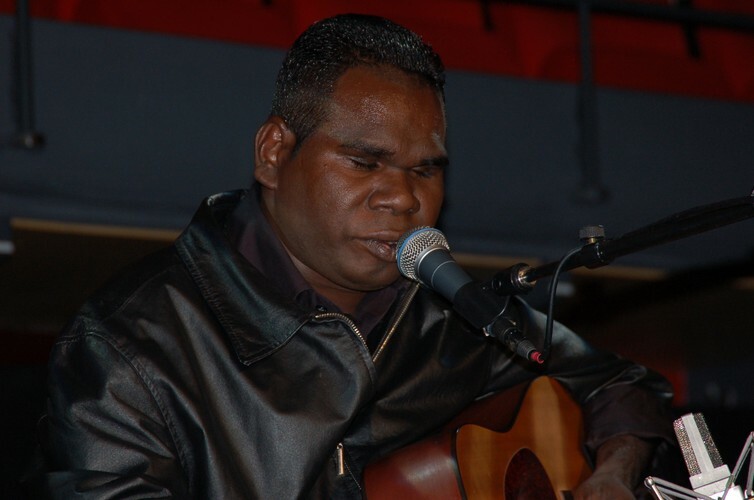 Geoffrey Gurrumul Yunupingu (born 1970) is an Indigenous Australian musician, who sings in the Yolngu language. He was born in Galiwin'ku (Elcho Island), off the coast of Arnhem Land, Northern Australia about 350 miles from Darwin. He is from the Gumatj clan of the Yolngu and his mother from the Galpu nation. He was born blind, has never learned Braille and does not have a guide dog or use a white cane. Yunupingu speaks only a few words of English, and is said to be acutely shy. He plays drums, keyboards, guitar (a right hand-strung guitar left-handed) and didgeridoo, but it is the clarity of his singing voice that has attracted rave reviews. He sings stories of his land in both languages (Gälpu, Gumatj or Djambarrpuynu, all Yolŋu Matha) and English. Formerly with Yothu Yindi, he is now with Saltwater Band.